Fields of Blood: What Happened Next? 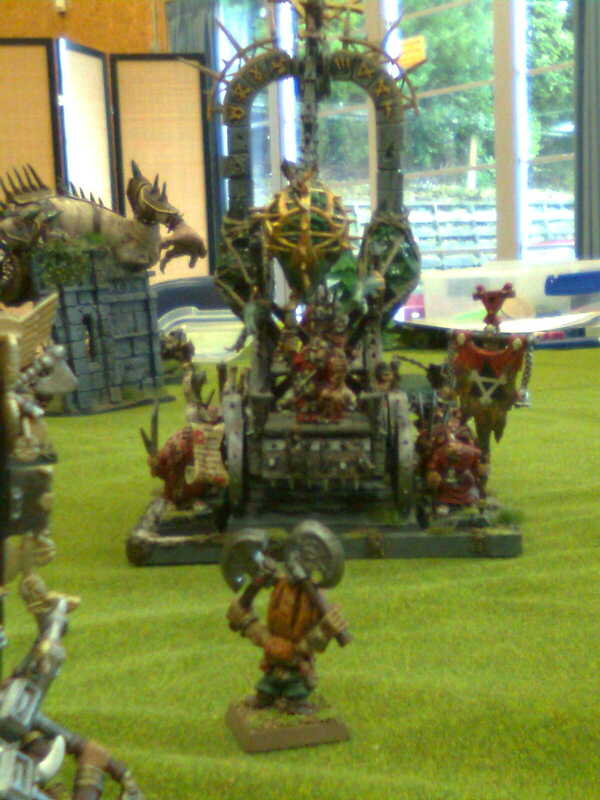 So here's a little picture from a recent game between myself and Tane with his Dwarfs. As you can see the Skaven Plague Furnace is rampaging forward and bearing down on the Dwarf lines. Standing in its way is a lone Dwarf Dragonslayer. Post your thoughts and I'll post the answer tomorrow. The Plague Furnace is bearing down on the Dwarf lines.....only the Dragonslayer stands in its way. If you believe the propaganda of the "Gotrek and Felix" books the Doomseeker will step up and destroy the Skaven contraption. Well dear readers, here is a lesson in life for you - don't believe everything you read! Faced with an honourable doom our brave red-headed stunty deftly steps out of the way so he is no longer in the charge arc of the Furnace which now barrels forward into the Dwarf defences. All talk, no trousers, these stuntys. The brave 'doomseeker' slinks off and eventually eats a mouthful of Warplightning for his cowardice! Unfortunately in life, there are no happy endings!!! The Slayer bites his lip, drawing blood, and utters an invocation to his ancestors. Drawing on the berserker rage burning deep within his shame, he rushes headlong into the vile contraption, climbing upwards towards the Ratman leader atop a growing mountain of corpses. The surprised Warlord is split from head to toe. He climbs to the top of the structure, and throws both axes down towards the front wheel axle, each slicing through rotting, corrupting wood. The Furnace collapses around him, and after an earth-shattering explosion of warpstone and shrapnel, is left standing atop the wreckage. Denied an end to his shamed existence and another chance to redeem his honour, the lone Slayer bellows in rage and sadness. His tears stream with his blood and the blood of his foes, and his primal scream echoes though the End Times. The Grey Seer skitterleaps in front of the Dragon Slayer, then throws 6 dice, gets an IF, and turns him into a rat!! Pete, the code of the Slayer also says "Don't help the enemy". In this case, charging a no-armour, no-ward, I4, 2W character into a Plague Furnace (d6 T tests, small chance of a wound) with a 4 attack, S6 Plague Priest is a bad idea. It's an even worse idea when doing so will block the cannon shot which killed the Furnace 2 phases later. Unfortunately a Dragonslayer, despite the name, might, with luck, kill an Ogre or possibly even a Troll. A Plague Furnace, and even a stinkin' Plague Priest, is generally beyond him. Which is what actually happened in this case. You charged him in your next turn, and the Priest killed him with his 4 S6 attacks. The weakest waaagh in the west? Wayland Games - Fighting the Good Fight! "I'm Just Not That Into You" - Today, at least! Pre-Measuring - Yay or Nay? Okay, Who Thought This Was A Good Idea?